Hard training is the only real way to make continuous improvements in any sport, whether it’s speed, strength or muscle size you’re after. That same training intensity that eventually leads to advantages can also cause an increase in cortisol levels – a gain-reducing catabolic hormone that can break down muscle and block protein synthesis. Compound that effect with increased cortisol levels from other sources of stress, and your gains can be fully stalled. 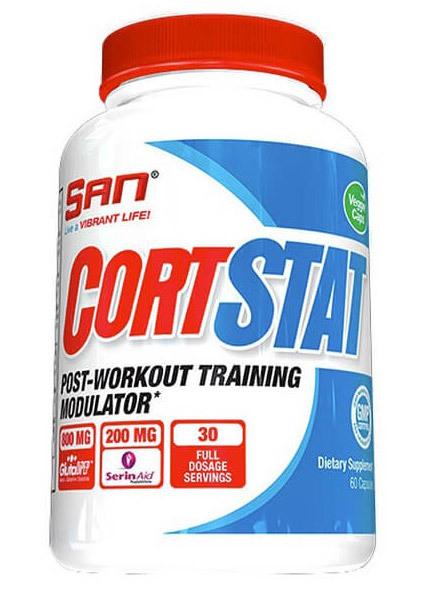 CORTSTAT is a new and potent formula that reduces cortisol to preserve muscle tissue after workouts and protect all your hard-earned work from cannibalization. Phosphatidylserine (SerinAid) has proven abilities to decrease cortisol levels, enabling greater amino acid utilization for enhanced nitrogen retention, glycogen synthesis, and protein synthesis. This muscle-preserving element also aids in memory retention, so it can help you excel in physical and mental fitness. The Alanyl-L-Glutamine Dipeptide (GlutaDiPEP) in CORTSTAT not only stimulates glycogen synthesis and inhibits muscle breakdown similar to Phosphatidylserine, it also works on multiple levels to rehydrate your cells and provide your body with sustained energy to truly maximize performance levels. This easily-absorbed dipeptide increases nutrient absorption and supports a healthy immune system to further keep cortisol levels in check. CORTSTAT is a highly effective protector against post-workout muscle wasting from intense training while maximizing muscle repair and growth. The definition of muscle insurance.